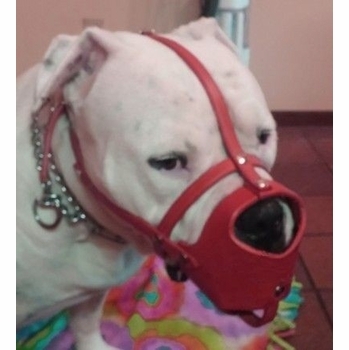 Our custom made leather dog muzzle is hand made to your dog�s exact snout measurements. Do you have a dog that has a short flat snout or a long wide snout that a pre made muzzle just won't fit correctly? Now you can have a stylish and good looking leather muzzle made for your dog? Our custom made leather muzzle will allow your dog to open their mouth for panting, eating treats and drinking water. We feel if your dog must wear a muzzle, let it be a pretty one! Please WATCH the measuring video below. This muzzle is made to your dog's exact measurements. We need the following exact measurements in inches. A. Top line the length of the nose, from tip of the nose to the base of the eyes. B. Jaw line (side of face) from tip of nose along the jaw to the end of the jaw bone (90 degrees down from the ear). C. Circumference of the muzzle, mouth closed right behind the nose. D. Circumference of the neck behind the ears. The measurements are very important and have to be exact. No guessing on the size of this muzzle as once it is made to your dog's measurements, it can not be exchanged or sent back for a refund. This muzzle can be made for Pekingnese, Lhasa Apso, Pugs, Boston Terrier, Labs, German Shepherds, Pit Bull, Bulldogs, Mastiff and most size dogs. This custom leather dog muzzle has a head strap. The head strap runs between the dogs eyes, over the head and attaches to the strap that fits around the dog's neck. The head strap will help to keep the dog from pulling or pawing off the muzzle. This is a custom made dog muzzle and will take about 10 to 15 working days for you to receive. This custom made muzzle can not be exchanged or send back for a refund. The factory that makes this muzzle ships out by priority mail. Please give us a valid phone # and e-mail address, just in case we need to ask questions about your dog's measurements. Please WATCH this video on how to measure your dog for a custom made muzzle.